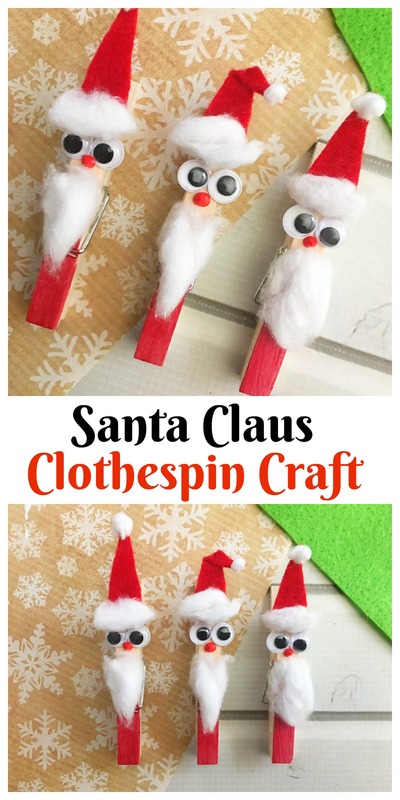 Adorable Santa Claus Clothespin Craft for Christmas! 2. 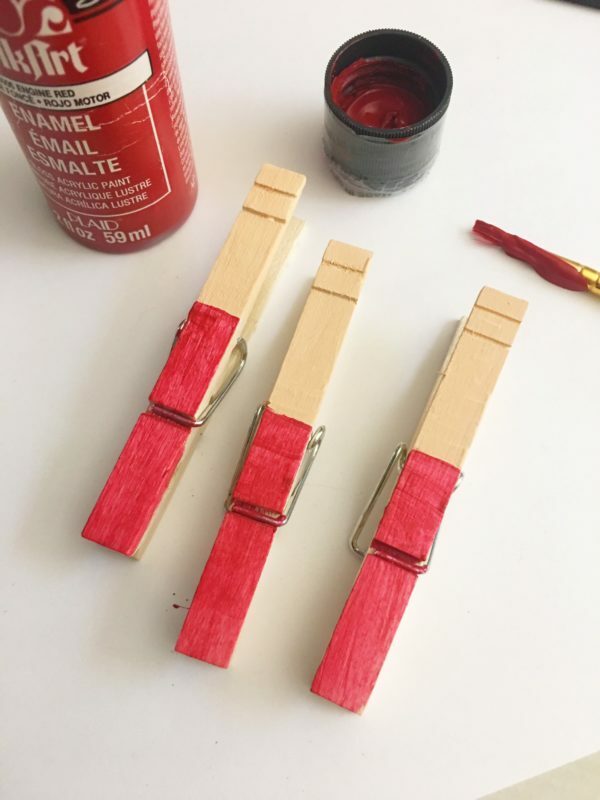 Paint the top front 1/3 of the clothespin with your flesh colored paint and paint the bottom 2/3 with your red paint and be sure to let them dry completely. 3. While your paint is drying, cut out three 1 1/2 inch long skinny triangle hats out of your red felt. Once your painted clothespins are dry, glue one hat to the top of the flesh colored side of the clothespin (you can bend of top of the hat to the side and secure with glue or leave straight). 3. Pull apart a cotton ball and glue a piece on the bottom of the hat, a small ball for the top of the hat and a piece for the beard (form them with your fingers to get the shape you want). 4. Next, glue two googly eyes below the hats. 5. 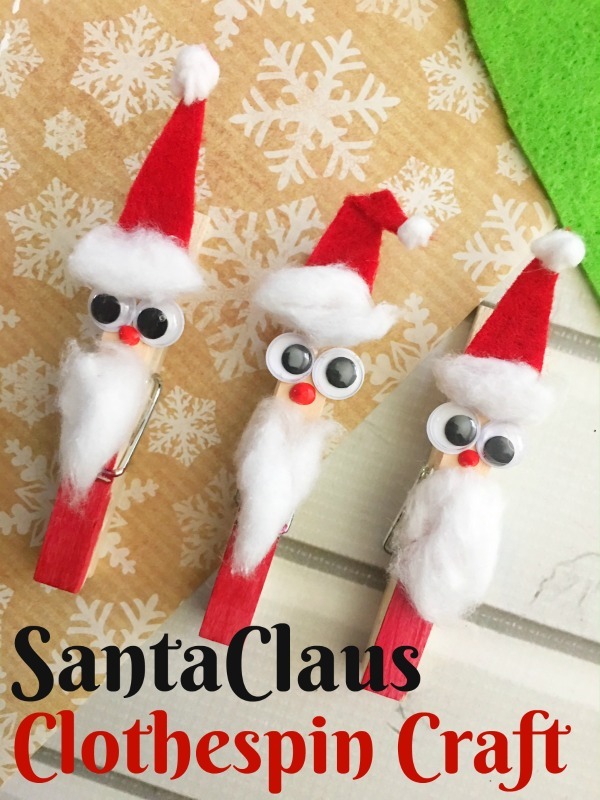 Now use your red puffy paint to make a dot below the eyes and above the beard for a nose and let your Santa clothespins dry. That’s it – you’re Santas are done! 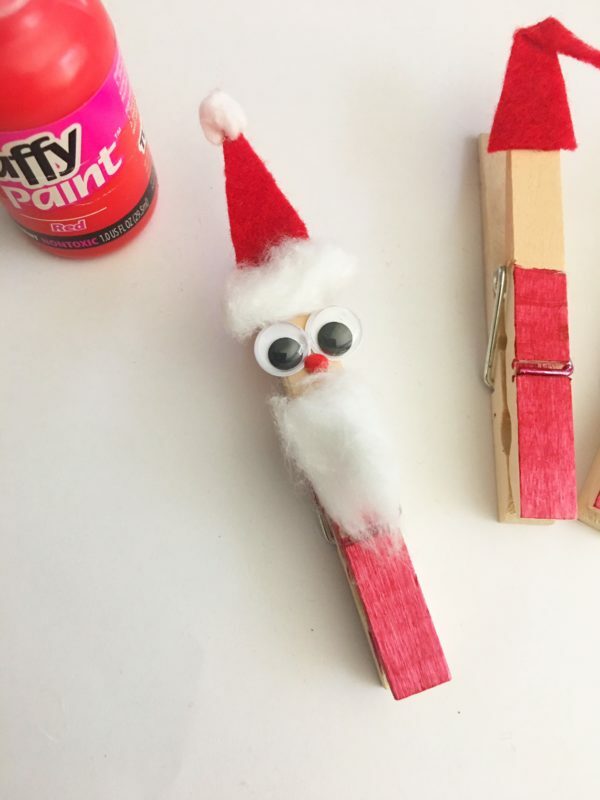 This Santa Claus Clothespin Craft is really easy to make.. I might try my hand at Mrs Claus soon, but for now, I am happy with my Santas. Have you made any clothespin crafts? 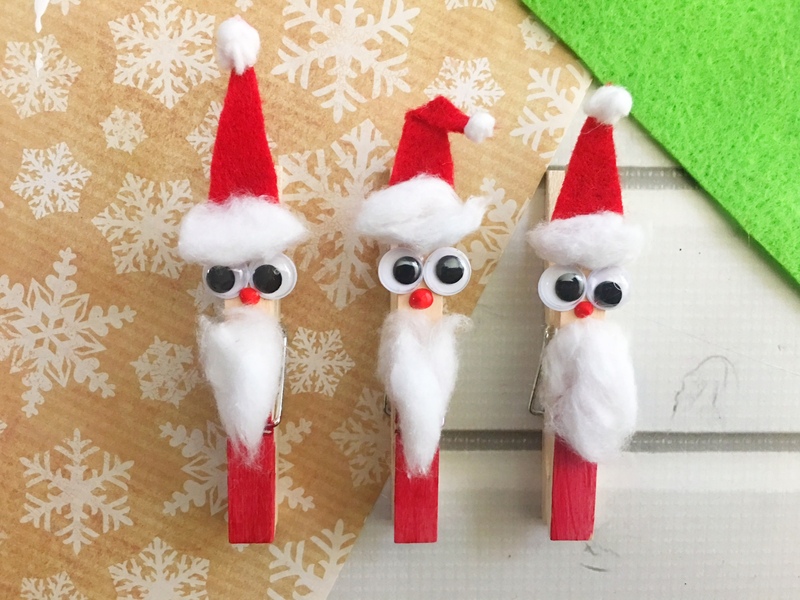 If not, give this adorable Santa Claus Clothespin Craft a try this Christmas. I will surely try this idea with my little girls. These Santa Claus clothespins are so cute! I love this idea! I think it would be so cute to pin them or even just place them around the Christmas table for everyone to find and have their own one! Those are so cute! I can see using these as Christmas tree ornaments or to clip onto the stockings for a little extra fun decor. I love these! They remind me of Stick Stickly on Nickelodeon when I was a kid. We used to make all kind of popsicle stick people. So fun. This is such an adorable craft. It would be perfect to do for a homeschooling lesson. So cute! I have been looking for Christmas crafts for our art lessons, this has got to be added. Aww these are so cute. I’ve seen the reindeer versions but never thought to make them into Santas! I love this! I love this idea. I also love that it’s a childhood memory for you, and that you are recreating it. These are certainly special. I think we may give this a try. Aww, those little beards and eyes are the best. These are amazing little Christmas crafts. This is such a cute idea, I love it. This would be a fun craft to do with kids! These turned out so cute! I love easy Christmas themed crafts like this one. These would be great themed crafts for a school project! I love their big googly eyes! I adore this cute craft! It looks incredibly easy! How cool are these! I’m going to make these with the kids to add to our tree this year. These are such a cute idea! We made stuff like this when I was a kid. I will have to make some of these with my sons. I love revisiting old childhood memories with my own kids. I am so sorry to hear about your Mom. I hope you have a good Christmas! These clothespins are seriously cute! I love your DIY crafts because they are easy to make and all turn out to be beautiful. I will share this with my teacher friend. She’ll have fun making these with her students. What a lovely Christmas memory and I’m glad you got to bring it back to life with this craft! It’s really adorable and it fits the budget too! I love this. I will have to try it with my daughter. She loves doing crafts, but I’m not too crafty myself. Very cute craft. Best of all, it’s easy for the kids! What an adorable craft. My little one would absolutely love to do this! My kiddos are loving holiday crafts a little extra this year. And I’m loving spending time together. These clothespins are so cute! This is adorable! I would love to make these to hold my Christmas cards! So easy. These are so so cute!! I may have to make these with my little niece since she LOVES doing crafts! I love clothespin crafts! These Santa Claus pins are a really cute idea. I really like this idea! The kiddos and I can do this one Christmas Eve for fun! These are so cute!! I want to make these with my boys. I love simple and cute crafts like this! Adorable! This is a cute holiday diy! I think this would be a great school project. This is SO cute! I will definitely try this! I can’t help but miss my mom during the Holidays and I try to make sure there are elements in my decor that would help me honor her memory. I think it’s really nice that you’re recreating this DIY ornament! I’m sure it brings back memories. Wow! These are so cute! 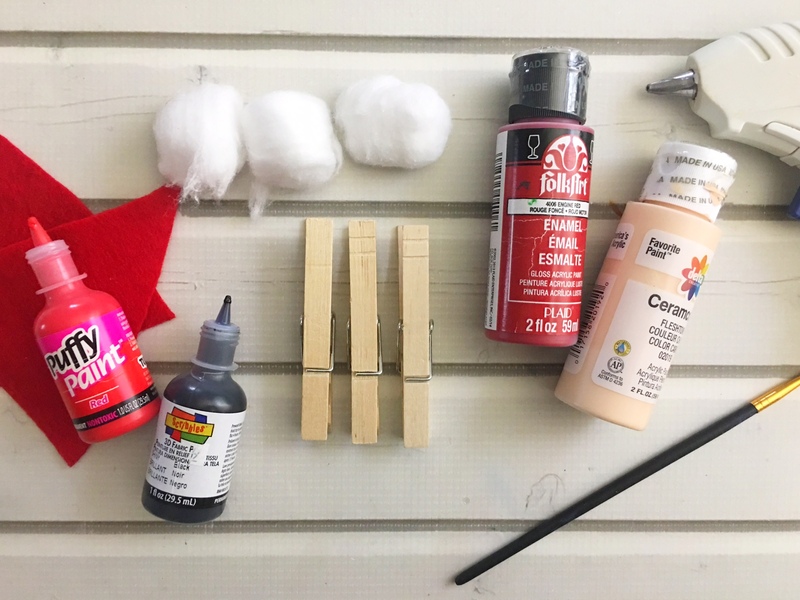 Simple crafts are the best to do with the kids! We’ll have to make some for our tree! These are so super cute! What a fun and fabulous idea. My kids would have a great time with these and love to stick them on the tree! These are the cutest! I love the way the hair and beard looks! This would super fun to use for all our Santa pics from the past years! These are so cute. I love that you share such good ideas of things that I can do easily. What a cute idea! My daughter loves to craft, and we have clothespins! I can’t wait to make this with her. These little guys are super cute! I have a bunch of clothes pins at home so I will have to try this out. Oh my goodness – that is a super cute idea for the holidays! I bet our kids would love to make this at home. This little Santa clothespins are so adorable. What a fun activity to do with the kids on a cold day during holiday break. This is definitely something that I would make! I think it’s better to make your own ornaments, it adds the fun in all the Christmas prep! This is adorable! This is so awesome! It’s so cute I’m going to try making this. Those made me smile all over! How stinking adorable are those little guys? I want them all over my tree. Adorable indeed, Robin.. such a lovely addition to your tree. And you can make it together with the kids..
That Santa Claus clothespin looks adorable. An easy and simple DIY project to make too with the kids. This is such an adorable craft. I like that it is so easy for kids to do and make. This is so cute and my daughters would love this craft. What a fun and easy project with supplies I already have at home! This Santa Claus clothespin are so adorable. You really did a great job of doing this kind of craft. Perfect Christmas decoration for our garden. This is so cute and so simple to do. It’s a great craft to have the kids make this Christmas.